Many consumers have a love-hate relationship with airlines: We love that they get us from point A to point B faster than a car, but we hate all the little fees, the inevitable delays and the occasional lost bag. It looks like all that hate once again won out, as this year’s Airline Quality Rating Survey found performance declined across all customer-focused categories just a year after the industry’s best scores in 25 years. The only carryover from the hopeful 2013 report was Virgin America’s ranking as top airline for the third consecutive year. Each year, the report gives consumers a bit of insight on what their fellow travelers have experienced and an idea of which airlines they might be better off avoiding. When looking at overall airline rankings, the report once again crowned Virgin America as the supreme airline. 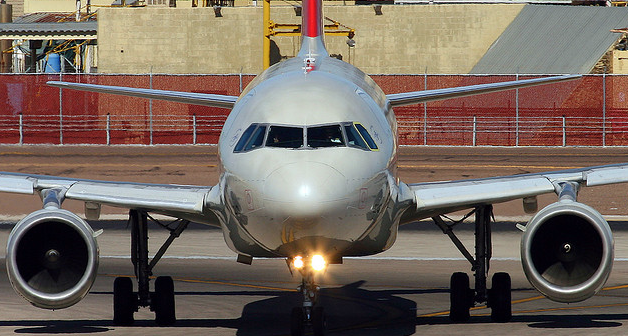 The airline has topped the rankings each year since it was first included back in 2012. According to the report, Virgin America came out on top for avoidance of denied boardings and baggage handling. Rounding out the top five were Hawaiian Airlines, Delta Air Lines, JetBlue and Alaska Airlines. Bringing up the rear in the ranking was Envoy/American Eagle, a regional carrier for American Airlines. The smaller airline had the worst on-time record with just 68.6%. This year the airline industry as a whole saw a decline in performance thanks in part to crowded planes, outsourced baggage handling and more expensive ticket prices. Overall, only three of the 12 U.S. airlines evaluated improved over the past year, while one held steady and eight declined in performance. As an industry, on-time arrivals declined from 78.4% of scheduled flights in 2013 to 76.2% last year. Hawaiian Airlines posted the best on-time performance with 91.9% of flights landing on schedule, while Envoy had the worst, with 68.6%. Larger airlines didn’t fare much better, with American – which now includes US Airways – and Southwest both seeing slight decreases from the previous year. Only JetBlue and Frontier actually improved their arrival rates in the past 12 months. The number of passengers denied boarding by airlines also increased in 2014 to 0.92 per 10,000 passengers from 0.89 the previous year. The worst airlines in this category were ExpressJet Airline and SkyWest Airlines, which tied for worst with a rate of 2.71. Hawaiian and Delta Air Lines each improved on their scores from last year, while American and Southwest recorded more average rates just slightly higher than last year; 0.55 and 1.11, respectively. The number of passengers left dealing with misplaced, lost or damaged baggage also rose in 2014, despite improvements by five airlines. In all, the industry’s mishandled-baggage rate rose from 3.21 per 1,000 passengers in 2013 to 3.62 in the most recent report. Virgin America topped the rankings in this category with a 0.95 mishandled rate, while Envoy came in dead last with a rate of 9.02. Perhaps the biggest sign of passenger’s distaste for airlines can be seen in consumer complaints. This year, the industry saw an increase of 17% when it came to complaints. In all, the occurrence of consumer complaints rose from 1.13 per 100,00 passengers in 2013 to 1.38. Alaska Airlines recorded the lowest consumer complaint rate with a 0.42, while frontier had the most complaints with 3.91 per 100,000 passengers. A majority of the complaints received by the Department of Transportation were for flight problems (37.8%), baggage issues (14.3%), reservations, ticketing and boarding (11.3%) and customer service (10.6%). While a year punctuated by heavy winter storms could be one reason for airlines’ overall poor performance, researchers say a lot of the downfall might have to do with large mergers still being ironed out. But the researchers tell consumers to give it a few years, and the airlines on the brink of completing mergers – including Southwest and AirTran, as well as American and US Airways – will likely bounce back a bit.